Last week-end we left Bergen for a few days. 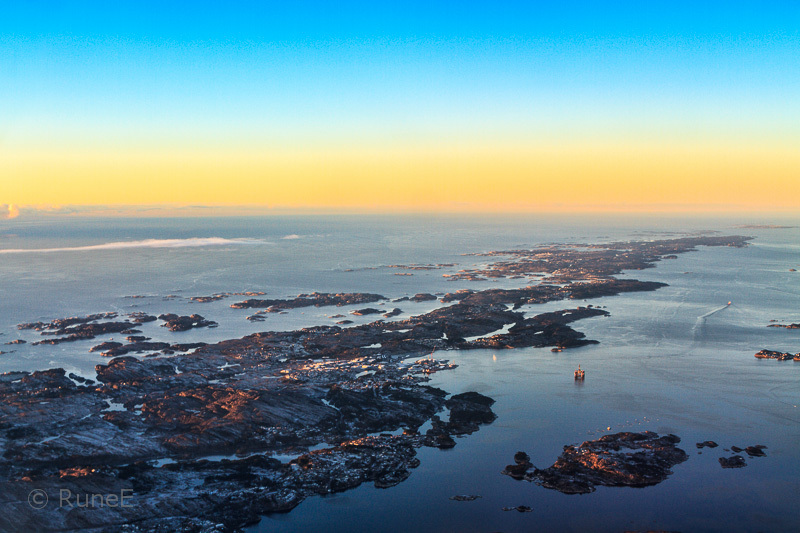 As the air-plane turned, we could enjoy the view of some the many islands stretching along the Norwegian coast (in this case belonging to the municipalities of Fjell and Øygarden) and of the glowing sunset over The North Sea. 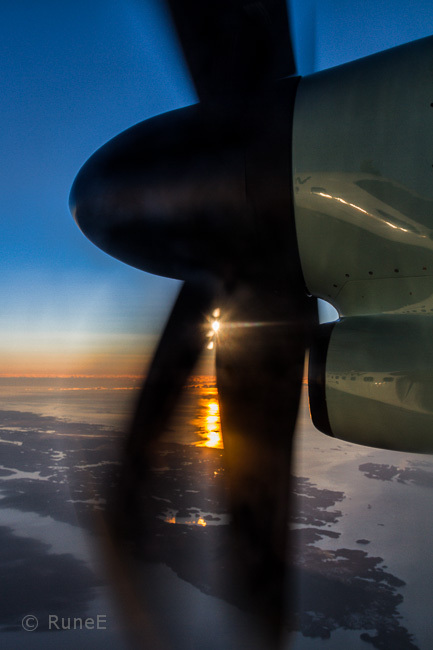 When you are seated beside the engine, it is not essy to get a proper view of the sun itself as it sets. But I did my best. Both pictures are soooooooo gorgeous! The first one makes me want to visit there , discovering each of those islands. The second one could be used as a symbol for travel, adventure, departure.And this light....an hypnotic attraction! You are a wizard at catching the sun in tight spots! And wow, a yellowish sky. Photos of the roof of the world. love them both. Takes me back to those childhood days when I used to look out to sea from the east coast of England wondering what lay beyond the horizon. It's even more strange and beautiful than I imagined. I'm intrigued by all the horizon lines in your top photo. You too have a great week-end! What superb shots for the day, Rune!! These really took my breath away and your composition is superb!! Always a pleasure to visit your blog!! Hope you're enjoying a great weekend! Hugs and happy weekend too my friend. Solnedgnager.. og oppganger har vi da sett utallige av. Mye mer spennende dette. Får lyst tilå sette meg i nærmeste fly!! Oh, that Norwegian light!!! Well done on the capturing of it. Have a great weekend! Beautiful and just love the sunset from the plane, great stuff my friend. I'm rather fond of the engine shot! The islands are breathtaking. I would have thought there would be more ice, has it been above freezing? Great shots! What a wonderful glow the setting sun gives when you can see the whole horizon. And one must really know where he is to travel by boat among those islands. Ohhh don't feel sheepish my friend. Finding your beeeeeehheee words made me smile. And thank you so much for your compliment. You just say it all in your pictures. Both of these photo are so good! The glow looks beautiful. As if sun dissolved in that stripe! Amazing shots! The sunlit horizon reminds me of some of the photos from the International Space Station, where you see that atmospheric stripe. Love the glows on the islands - really looks like the beginning of an adventure! Amazing the air is so clear. What a view. Flotte bilder fra oven .... har akkurat vært på vingene jeg også, men bekmørkt. Syns det nederste bildet er helt utenom det vanlige, bare helt knall! Blinkskot begge to synest eg. Flotte billeder du fik fanget fra flyet. LYSET er jo netop det, der er allervigtigst her i disse mørke tider. Ja, det har vært noen flotte solnedganger i denne kuldeperioden, men jeg har hverken hatt tid eller anledning til å forevige den. Your view might not be proper, but it's really dramatic and interesting. Also a great, more traditional shot of the islands. I hope for more travel photos soon. You find beauty wherever you go, don't you Rune? I don't know where you were headed when you took off, but the top picure took my breath away when I saw it. The gorgeous skyline and those islands....honestly, it's just indescribable how lovely the whole scene is. The lower picture is something as well!! I think it is terrific that you had to snap pictures from the airplane. I love that you did, and just look at the one you got, along with the propeller on the plane. That sun is something to rave about!! You see, I am getting to really appreciate photography for photographies sake. I never had an idea when I stumbled on to your blog that it was going to be all about photos. I knew absolutely nothing about it, even though my brother in law and my nephew are great photographers. My brother in law was a professional, having his own studio and making a very good living taking mostly photographs of his clients. His father before him did the same thing so I guess it came naturally with him. My nephew, so far, has just enjoyed taking all kinds of pictures. I must put him onto you, so that he can visit your blog. I kinda feel sorry for his wife, because everywhere he goes, he makes so many stops, so that he can take pictures, that it takes them forever to get to their destination. I don't really like to travel so would hate having to stop so much. Sist søndag ble det fototur til Tofterøy og Glesvær. Kanskje jeg bør ta Øygarden denne helgen.... Men så var det dette fotolyset da. Dårlig værmelding denne helgen.Og å få så fint lys som du har her skal noe til. Bilde ditt over Øygarden er nydelig.